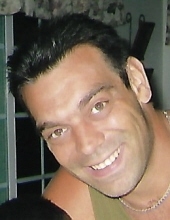 Joseph A. Villari, age 46, passed away on August 31, 2018. Raised in South Philadelphia, Joseph attended Southern High School and lived in New Jersey most of his adult life. Joseph was predeceased by his mother Josephine (nee Kilroy) Villari and sister Phyllis Villari. Survived by his children Dominic, Gabrielle, Nicholas, Danielle, his father Frank Villari, siblings Philip, Frank Jr., Angela, Paul and Josephine Villari, and grandchildren Giovanni and Myla-Rose. Friends may greet the family on Saturday after 9am in the Budd Funeral Home, 522 Salem Ave. (Kings Hwy), Woodbury, NJ. Funeral service will be at 11am. Memories may be shared at www.buddfuneralhome.com. To send flowers or a remembrance gift to the family of Joseph A. Villari, please visit our Tribute Store. "Email Address" would like to share the life celebration of Joseph A. Villari. Click on the "link" to go to share a favorite memory or leave a condolence message for the family.